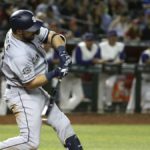 In July of 2016, the San Diego Padres spent on the international market as they had never done before. The result is a farm system revitalized with numerous talented young players. Here is a look at that group of men. 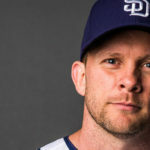 This series of signings by the Padres might be the most pivotal in the creation of the farm system you see before you. 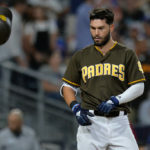 With penalties, the Padres spent over $80 million on teenage talent as the franchise had never done at any point in their existence. Seven of these men are already on the Padres top-30 prospect list, and a few more have the chance to be, in time. The international market has changed its rules now. The Padres were the last team to take advantage of the old system. The Friars were penalized for two seasons, but the rewards of this group of players far exceeded the penalties the team had to pay the last two calendar years. Here is a glimpse at some of the players in that rare class. 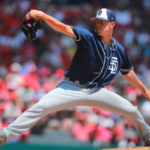 This right-handed pitcher was initially drafted as a shortstop in 2016-17. The Colombian native always displayed a rocket arm while playing the infield, but who would have thought he would show plus secondary pitches and an ability to stay composed. He is athletic and a great student of the game. 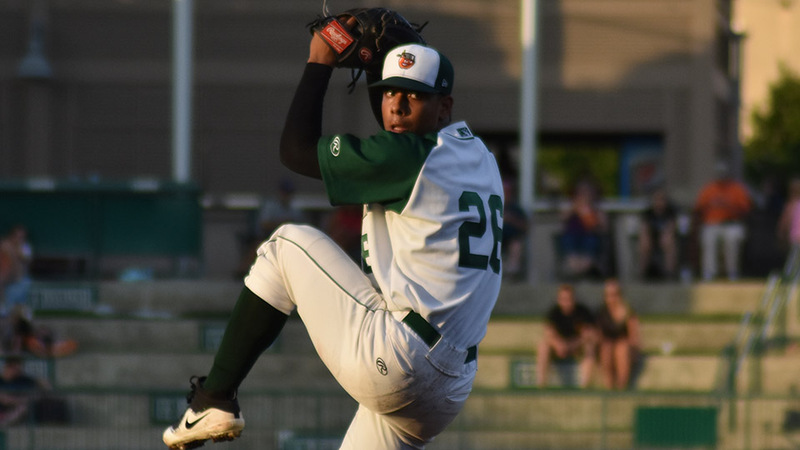 Patino broke out in 2018 and should continue to develop in the California League and beyond. Morejon came with much fanfare as the Padres spent $11 million on the left-handed pitcher from Cuba. He is 20-years-old and has excellent stuff. There are some concerns about his health as Morejon has yet to eclipse 65 innings in a season. He has a high ceiling and should take his game to the next step in 2019. Baez was signed for $3 million and has blossomed in the system. In 2017, his velocity was up in the 97-98 mph range, but a nagging back injury limited his speed last season. He was up to 96 at the Don Welke Classic in September, so everything seems to be okay with his arm. He has a very loose motion despite being 6-foot-8. Baez needs to be consistent with his secondary to remain a starter, but at the very least, he should be a late-inning reliever. Defense is his forte, but the bat is developing. The right-handed hitter from Venezuela has plus power. His swing can get a bit long when he tries to do too much, but there is a lot to like with his offensive potential. He has plus speed and a rocket arm. He should one day make the major leagues on his defensive abilities alone. This left-handed hitter has excellent hand-eye coordination. He is ambidextrous and able to do a running backflip ala, Ozzie Smith. Rosario is an athletic outfielder. At 19, there is much reason to be excited about his ceiling. He played in Fort Wayne last year recording a .722 OPS in 112 games. This 19-year-old outfielder from Tijuana has a beautiful swing. He battled some injuries last year only playing in 86 games recording a .732 OPS for the TinCaps. He has a great eye at the plate and added muscle this offseason. 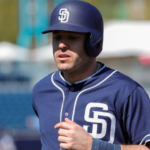 He could have a very nice offensive year in Lake Elsinore. 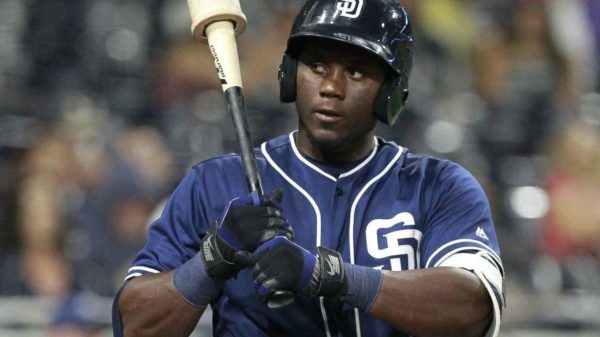 Marcano came out of virtually nowhere last year, to landing on the Padres top-30 list according to MLB pipeline. He recorded a .888 OPS in 52 games between the desert in Arizona and Tri-City. The 19-year-old left-handed hitter has a great ability to put the ball in play. He walked 30 times last year in 194 at-bats while only striking out 16 times. Marcano could be an extraordinary player if he can gain some weight and add power to his swing. This Cuban outfielder has a ton of talent but is struggling to put it all together. He only hit eight homers last year in the California League (368 at-bats), and power was supposed to be his forte. There are some concerns for Ona, who is built like a fire hydrant. He has great muscle mass but is not the most prominent outfielder in the system. He will need to refine his approach and put the ball in play to advance through the system. There is still time for him. 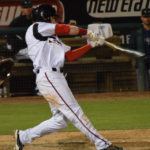 Switch-hitting infielder Justin Lopez is progressing very well. He started last season in Fort Wayne as a 17-year-old and hed his own. Lopez has a developing bat and great size at 6-foot-2 to get better in time. In Arizona this spring he looked more muscular and was playing an excellent shortstop. He has the size and bat to move to third eventually, but he may be alright at short moving forward. Barley has had issues developing but is still only 19 years old. The right-handed hitter shows flashes but has some real holes in his swing. He has yet to make it passed the Arizona rookie league in his career. Barley looked decent this spring but still is not polished as most of the J2 players signed in the same year as him. 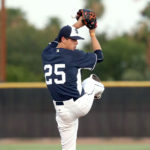 22-year-old Ronald Bolanos has a terrific arm. The Cuban national threw 125 innings last year in Lake Elsinore but was hit around a bit. At 22, he has an excellent chance to start in Amarillo in 2019. He has a plus fastball but needs to refine his secondary to continue to start. He could be a relief option for the team eventually. This left-handed Cuban pitcher is very impressive despite not being the most massive pitcher in the system. He pitched well last year as an 18-year-old and should get a start at full-season ball this spring. Perez has an excellent chance to remain a starting pitcher in the system as he commands his secondary pitches very well. Another left-handed from Cuba with plus stuff is Hernandez. He was terrific last year at Fort Wayne going 11-4 with a 1.81 ERA and a 1.195 WHIP. 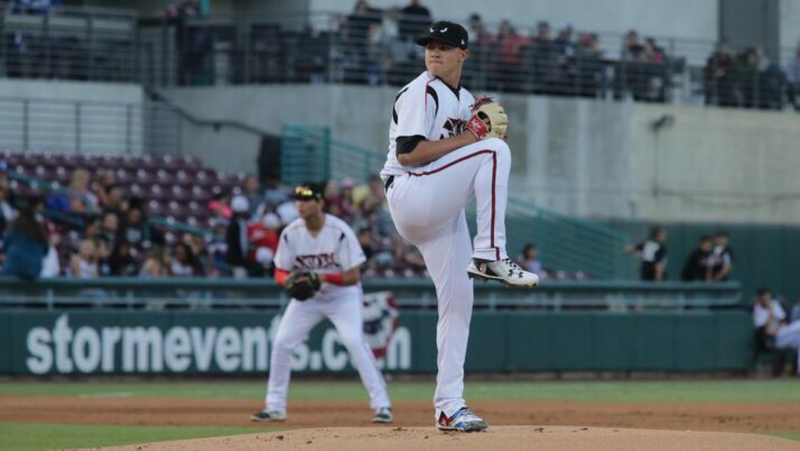 The 20-year-old should be in Lake Elsinore this season as he furthers his development. The lefty is presently a little banged up physically but should be a factor in 2019 for the Padres minor league system. 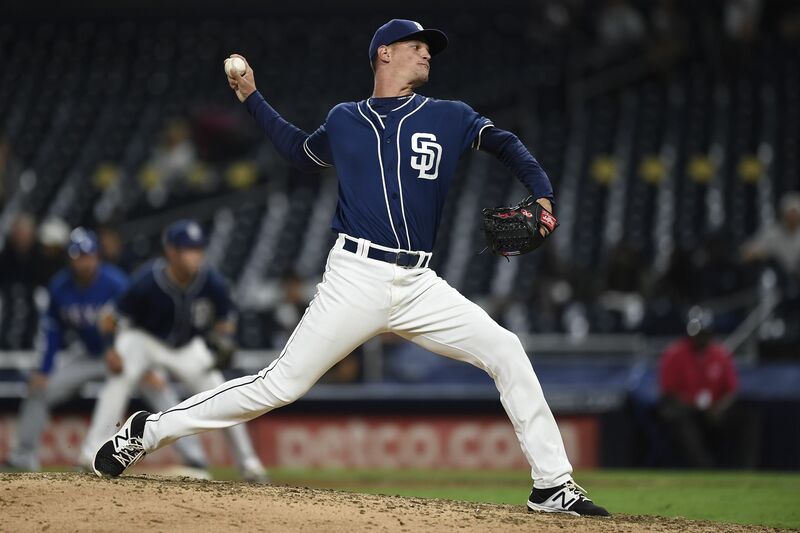 At 19, and armed with a power fastball, Miliano has been frustrating so far for the Padres. The Dominican right-hander has excellent ability, but mechanics and control are a severe issue for him. He strikes batters out but is also wild in the strike zone. The 6-foot-3 pitcher has decent size and could figure it out eventually. Mexican outfielder Augustin Ruiz generally flies under the radar, but he has an excellent chance at being a decent prospect one day. He put up a .829 OPS in over 200 at-bats last season between three teams in the system. The left-handed hitter has great size 6-foot-2 but is very thin presently. The power should come eventually, and when it does, he could be a good one. This 19-year-old right-handed pitcher from Tijuana had a very nice 2017 season in the DSL. He struggled last year with injuries, only pitching 11 innings in the desert. Carrasco does not have a power fastball just yet, but at 19 there is time for him to improve on that. He knows how to pitch. 2019 could be a coming out year for this pitcher. He was supposed to be a plus hitter and one of the better signings from this J2 period. Instead, Almanzar regressed and hasn’t found his swing. He hit under .200 in Fort Wayne, looking overmatched last year in Indiana. In Peoria this spring he looked way better with the bat. He was also seen taking extra fielding work after a backfield game. There is still time for the 19-year-old to get back to prospect relevancy. 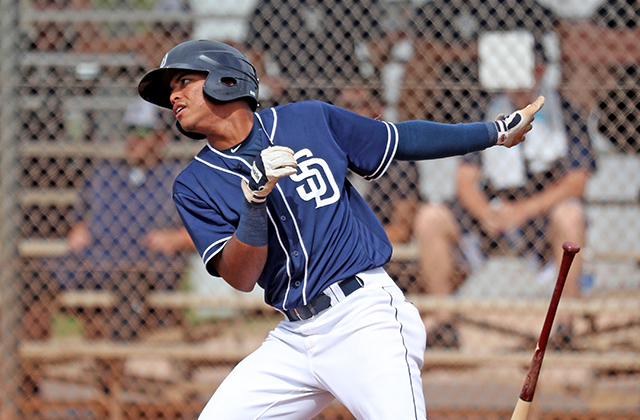 The Padres are stacked at the catching position, and Quintero adds to that depth. The 18-year old from Venezuela has a decent bat and is also a plus defender. He has added strength this winter and could be a factor for the team eventually behind the plate.